In the hours after the death on Wednesday of singer Davy Jones, Bob Rafelson spoke glowingly on Wednesday about the legacy of the Monkees, both the TV show he and partner Bert Schneider created in 1966, and the real-life group that emerged from the Hollywood sound stages for which it was assembled. In auditioning 437 actors and musicians for the four spots in the band, Rafelson said there had been no prerequisite that any of them would be British. Even though a real band, the Lovin’ Spoonful, was among those that showed up to the auditions, Rafelson said that musical credibility wasn’t the only factor. 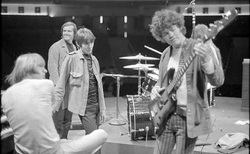 As for what landed Jones one of the four spots in the group, Rafelson said, “Davy was sort of a legit showbiz guy more than he was a rock ‘n’ roll kind of singer. I wasn’t sure he’d be able to switch, both in terms of the performance as an actor and the sensibility needed as a singer--or even if he would truly want to. He had his thing going as a Broadway and London stage performer. "But as soon as we started working together, everything changed. I just thought he would blend well with Micky and Mike and Peter," he added, referring to Monkees bandmates Micky Dolenz, Michael Nesmith and Peter Tork. “David had certain qualities just sitting in a room that I was interested in,” he said. “He was witty, his goals in life were not to be a show-business star. He was a jockey at this point, and he returned to being a jockey before he resumed his show business career. That interested me." Rafelson also directed and co-produced the Monkees' 1968 film, “Head,” his first movie. It was a commercial failure and maligned by many who saw it originally, but years later it began garnering a new appreciation for its surrealistic style and anti-corporate attitude. “It was outside of its time,” Rafelson said with a laugh. “I just showed it for the first time in a very long time, in Boston, and the picture is now being fanatically re-reviewed. Everybody wants their first-born to succeed, and of all my pictures, I think that’s the one that was the most neglected until the box set” that includes the film, he said, a reference to "America Lost and Found: The BBS Story," released in 2010. Today, Rafelson said, many people don’t realize how big the Monkees phenomenon was. “This was a massive thing,” he said. “They sold something like 23 million records in 1966—and that was more than the Beatles, more than the [Rolling] Stones that year. They had more No. 1 hits. I tell this to people now, and they say ‘What are you talking about?’ But [‘The Monkees’] was hugely rewarding and I take great pride in it." Photo: A rehearsal for the film "Head" in 1968 with Peter Tork, left, co-producer Jack Nicholson, Davy Jones and Micky Dolenz. Credit: Henry Diltz.